In the social sciences, a social group has been defined as two or more people who interact with one another, share similar characteristics, and collectively have a sense of unity. Other theorists disagree however, and are wary of definitions which stress the importance of interdependence or objective similarity. Instead, researchers within the social identity tradition generally define it as "a group is defined in terms of those who identify themselves as members of the group". Regardless, social groups come in a myriad of sizes and varieties. 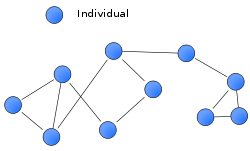 For example, a society can be viewed as a large social group. “The state of being dependent, to some degree, on other people, as when one’s outcomes, actions, thoughts, feelings, and experiences are determined in whole or part by others." It is obvious that some groups are more interdependent than others. For example, a sports team would have a relatively high level of interdependence as compared to a group of people watching a movie at the movie theater. Also, interdependence may be mutual (flowing back and forth between members) or more linear/unilateral. For example, some group members may be more dependent on their boss than the boss is on each of the individuals. All individuals who live in the same home. Anglophone culture may include various models of household, including the family, blended families, share housing, and group homes. The social groups people are involved with in the workplace directly affect their health. No matter where you work or what the occupation is, feeling a sense of belonging in a peer group is a key to overall success, Part of this is the responsibility of the leader (manager, supervisor, etc.). If the leader helps everyone feel a sense of belonging within the group, it can help boost morale and productivity. According to Dr. Niklas Steffens "Social identification contributes to both psychological and physiological health, but the health benefits are stronger for psychological health". The social relationships people have can be linked to different health conditions. Lower quantity or quality social relationships have been connected to issues such as: development of cardiovascular disease, recurrent myocardial infarction, atherosclerosis, autonomic dysregulation, high blood pressure, cancer and delayed cancer recovery, and slower wound healing as well as inflammatory biomarkers and impaired immune function, factors associated with adverse health outcomes and mortality. The social relationship of marriage is the most studied of all, the marital history over the course of one's life can form differing health outcomes such as cardiovascular disease, chronic conditions, mobility limitations, self-rated health, and depressive symptoms. Social connectedness also plays a large part in overcoming mental afflictions such as drug, alcohol, or substance abuse. With these types of issues, a person's peer group play a big role in helping them stay sober. Conditions do not need to be life-threatening, one's social group can help deal with work anxiety as well. When people are more socially connected have access to more support. Some of the health issues people have may also stem from their uncertainty about just where they stand among their colleagues. It has been shown that being well socially connected has a significant impact on a person as they age, according to a 10-year study by the MacArthur Foundation, which was published in the book 'Successful Aging' the support, love, and care we feel through our social connections can help to counteract some of the health-related negatives of aging. Older people who were more active in social circles tended to be better off health-wise. Social groups acquire and renew their members via recruitment. Compare proselytism. In the initial stages of expansion, the groups usually do not accept every applicant. One of the ways to build a reasonably closed group is to accept new members after one or more existing members propose and recommend them. Such group expands along the lines of other existing social networks. Other approach is to use existing members to evaluate the applicant, like in Microsoft interview. Member evaluation can also be delegated to some team that is not part of the group itself (like in high IQ societies). Some groups may choose to easily accept a lot of people but only leave the most efficient new members after probation (discarding others). In a society, there is an obvious need for more people to participate in cooperative endeavors than can be accommodated by a few separate groups. The military has been the best example as to how this is done in its hierarchical array of squads, platoons, companies, battalions, regiments, and divisions. Private companies, corporations, government agencies, clubs, and so on have all developed comparable (if less formal and standardized) systems when the number of members or employees exceeds the number that can be accommodated in an effective group. Not all larger social structures require the cohesion that may be found in the small group. Consider the neighborhood, the country club, or the megachurch, which are basically territorial organizations who support large social purposes. Any such large organizations may need only islands of cohesive leadership. 1 2 3 Turner, J. C. (1982). Tajfel, H., ed. "Towards a cognitive redefinition of the social group". Social identity and intergroup relations. Cambridge, UK: Cambridge University Press: 15–40. 1 2 Platow, M. J.; Grace, D. M.; Smithson, M. J. (2011). "Examining the Preconditions for Psychological Group Membership: Perceived Social Interdependence as the Outcome of Self-Categorization". Social Psychological and Personality Science. 3 (1). 1 2 3 4 5 6 7 8 Macionis, Gerber; John, Linda (2010). Sociology 7th Canadian Ed. Toronto, Ontario: Pearson Canada Inc.
↑ Hare, A. P. (1962). Handbook of small group research. New York: Macmillan Publishers. ↑ Gladwell 2002, pp. 177−181. ↑ Sherif, Muzafer and Sherif, Carolyn W., An Outline of Social Psychology rev.ed. Harper & Brothers: New York pp. 143–180. ↑ Sherif, op. cit. p. 149. ↑ Turner, J. C.; Reynolds, K. H. (2001). Brown, R.; Gaertner, S. L., eds. "The Social Identity Perspective in Intergroup Relations: Theories, Themes, and Controversies". Blackwell Handbook of Social Psychology. 3 (1). ↑ Turner, J.C. (1987) Rediscovering the Social Group: A Self-Categorization Theory. Oxford: Blackwell. pp. 42-67. 1 2 3 4 5 6 Forsyth, Donelson, R. (2010). Group Dynamics, Fifth Edition. Belmont, CA: Wadsworth, Cengage Learning. pp. 6, 8. ↑ McGrath, Joseph, E. (1984). Groups: Interaction and Performance. Englewood Cliffs, NJ: Prentice-Hall. pp. 61–62. ↑ "Webster's Online Dictionary - with Multilingual Thesaurus Translation". Webster's Online Dictionary. Retrieved 24 February 2012. ↑ "Workplace leaders improve employee wellbeing". phys.org. University Of Queensland. ↑ Umberson, Debra; Karas Montez, Jennifer. "Social Relationships and Health: A Flashpoint for Health Policy". National Center for Biotechnology Information. Retrieved 4 October 2016. ↑ Rowe, J. W.; Kahn, R. L. (1997). "Successful Aging". The Gerontologist. 37 (4): 433–40. doi:10.1093/geront/37.4.433. PMID 9279031. ↑ Staackmann, Mary. "Social Connections are a Key to Aging Well". Chicago Tribune. The Evanston Review. ↑ Reading, Hugo F. (1996). Dictionary Of The Social Sciences. Atlantic Publishers & Distributors. p. 171. ISBN 978-81-7156-605-1. Retrieved 2010-03-06. recruitment[:] obtaining membership on the part of a group. ↑ Holy, Ladislav (1996). "Group". In Kuper, Adam; Kuper, Jessica. The social science encyclopedia (2 ed.). London: Routledge. p. 351. ISBN 0-415-10829-2. Group [...] commonly refers to a plurality of individuals bonded by some principle of recruitment and by the set of membership rights and obligations. Everyone fulfilling the recruitment criteria is a member of the group and occupies a specific status in the group [...]. ↑ Scott, John Paul. Animal Behavior, The University of Chicago Press, 1959, 281pp. ↑ Halloway, Ralph L., Primate Aggression, Territoriality, and Xenophobia, Academic Press: New York, and London 1974. 496 pp.